I’m arriving at an interesting crossroad in my life this Mother’s Day. This past February, my eldest son moved out into his own apartment. And, in one year, my youngest son will graduate, and all things being equal, he will go on to university after that. And I will begin parenting from a different angle. There are a lot of terms for this transition, “empty nester” being one, but I like to think of this as a new adventure. It is my hope that within a year or so of my youngest son’s graduation, I will complete my PhD and therein enter a whole new phase of life. I’ve been thinking often about the road I’ve been on the past twenty plus years: mothering is not always easy, and living with an ever changing disability has brought many challenges that were not expected when I started out. Each step of my journey, from the loss of my first born and only daughter, to raising up these two now young men, has been an ever changing experienced informed by my role as their mother. Even now, my research for the PhD relates directly to experiences I have had, and stories that other mothers have shared with me. One thing I have noticed about mothering older sons is that it is much easier than when they were young. They are so darned independent, and a bonus is that they have lovely girlfriends. We live in a small community so they are able to transport themselves about for the most part. They are also helpful, in a way not possible when they were younger: I mean, they can mow the lawn, do the dishes, tidy, carry the groceries—the very things that were difficult to manage when I was having to do it all for three of us and manage my health. I see the difference for my friends with older children versus younger ones. I see we are more open in disclosing our limitations when something is simply too much. I see younger mothers learning to remain silent about their needs. I see them push too hard or struggle through completely inaccessible moments. Or remain outside of community for fear of judgement, or worse a phone call to the Ministry suggesting that they are not fit to parent. I worry for these younger mothers. I worry with every story that is shared with me. I know that with my research documenting disabled mothers’ narratives, my heart is going to be broken again and again by the barriers that mothers living with disabilities face daily. I want to tell these young mothers to trust their instincts. If you don’t feel safe disclosing your disability, don’t. But I also want to tell them that it does get better, and you can build a circle of women (and men) close to you who you can trust. When I was asked to write this blog, I wondered what DAWN wanted me to write about—the topic is pretty wide open, that of “mothering and disability.” Alas, Hanane, DAWN’s communication woman insisted on just that: write on mothering and disability. I could write about human rights, disclosure to schools and daycares, or how to navigate when your neighbours, or school or daycare, or other people decide to report you to the Ministry of Children and Families. I could write about housing and accessibility, or a myriad of other topics. And that is the thing. If I am writing about “mothering” there is usually a theme, because mothering, if you take out disability, is an enormous topic. So I am going to do what I have encouraged for so long. 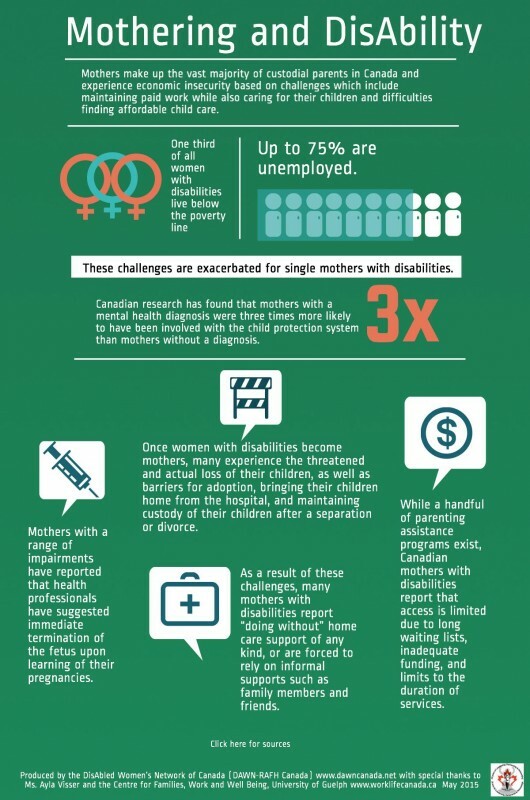 I am just going to start a dialogue about disability and mothering on this Mother’s Day, from my perspective as a mother, and I hope that other mothers across the country will join in this dialogue with me.